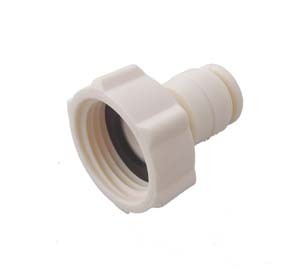 The Plastic Slip-lok Female Hose End allows you to connect to any male hose end fitting, such as a filter, garden hose or directly to the faucet. Our beige (compared to Arizona Mist tan, darker color tubing) colored 3/8" plastic slip loc fittings are rated at 300 psi, and uses 3/8" nylon tubing, the same size tubing as the Orbit tubing (rated at 160 psi). Push the tubing into the slip lock socket, the tubing will be locked. Tubing can be taken apart by applying equal pressure on the ring of the fitting and pulling straight out.